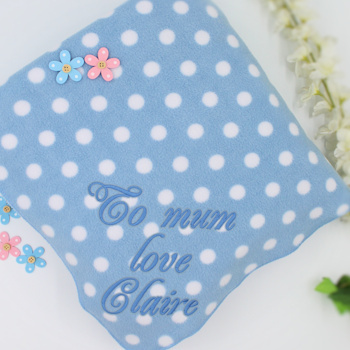 Personalised luxury fleece blanket or throw in blue with large white polka dots. Blanket will be made to the size you want: Baby size 75x100 cm Single size 100x150 cm Double size 200x150 cm all sizes are approximate. Embroidered with initials, a name, or short message of your choice in Large Fancy Script, Print, or Kids style lettering. A choice of thread colour to compliment the blanket. Snuggly soft polar fleece throw blanket with overcast stitch edging. Good quality non-pil polar fleece. Makes a great gift for Birthdays, Christmas, Anniversaries, Weddings and Housewarming!